The United States needs more academic rigor, higher educational standards and should demand more of its students, said Oklahoma Gov. 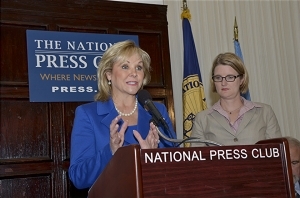 Mary Fallin (R), chair of the National Governors Association, before a full-house at a National Press Club Luncheon Sept. 17. Fallin introduced ‘America Works: Education and Training for Tomorrow’s Jobs,’ an initiative to close the gap between education attainment and skills needed in the marketplace that she will shepherd through the coming year as leader of the governors association. “Governors are in a unique position to foster an alignment between workforce training and job growth because they are the primary individuals responsible for education and the economy,” Fallin said. Fifty years ago more than 75 percent of all jobs required only a high-school diploma for good-wage jobs but today only 40 percent do and those jobs likely pay only $25,000 per year or less, she said. “A post-secondary education degree is the new minimum in America for economic success,” Fallin said, "but there are different paths for higher education.” One path is a college degree, another is a two-year associate degree and a third is a career technology certificate for a particular skill in the STEM (science, technology, engineering, mathematics) professions. Fallin called on businesses to be partners with states and tell governors what skill sets they seek in prospective employees. “We need to hear from them and they need to be at the table with us,” she said, describing a public-private partnership to realign education with job requirements. The initiative’s goals are to enable more students to meet higher standards; encourage them to enroll and complete a higher-education degree; help them find good paying jobs; and thereby build the country’s economy. In Oklahoma, Fallin has set up https://OkJobMatch.com to match job seekers with employers. Governors should retain state funding for the National Guard, first responders and emergency programs. Each state should have its own gun-control laws. Oklahoma fully defends the Second Amendment and supports the rights of gun owners. More women should be encouraged to go into politics. The secret to the pioneering women leaders of Oklahoma — Fallin, the first female governor and Vivian Vahlberg, the first female NPC president, “is the strength of women from the South,” said Fallin.